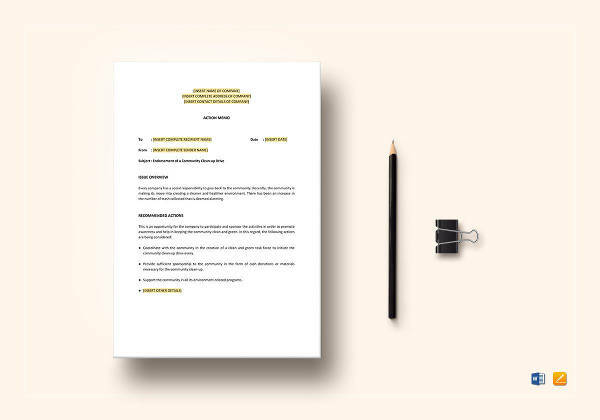 We’re all quite familiar on how Blank memorandums are used in the corporate world. Employers and employees alike, benefit greatly from this tool of communication. Company memos are used to remind employees of upcoming events that they must be aware of. 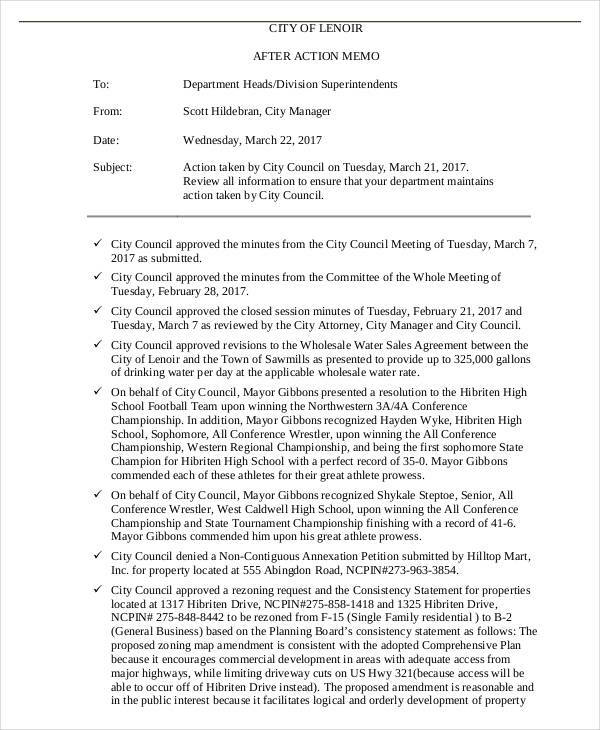 For instances when a department would like to instruct its employees on things that need to be addressed, an action memo is used. 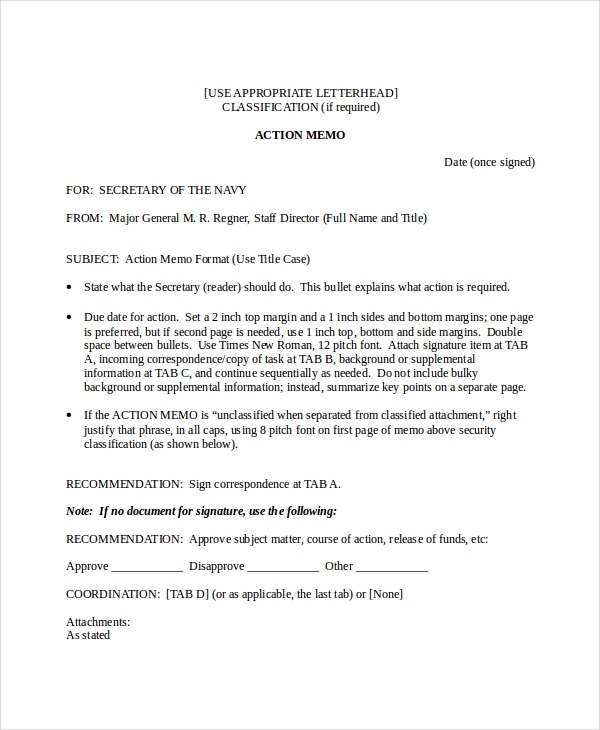 What Is an Action Memo? An action memo provides instructions that a certain entity must perform. 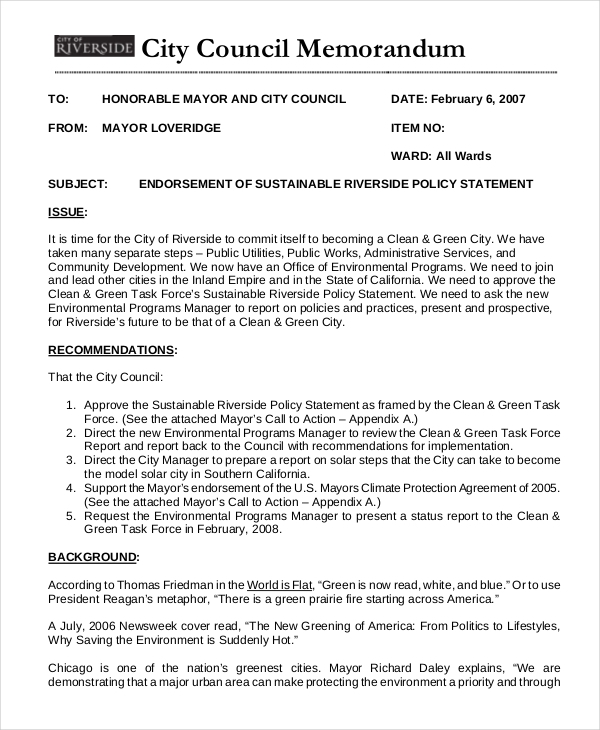 From the word itself, this type of memo is considered to be a call to action. They often consist of a list of instructions or guidelines that an individual must be informed of. Just like any other kind of memo, an action memo is written for a particular purpose. 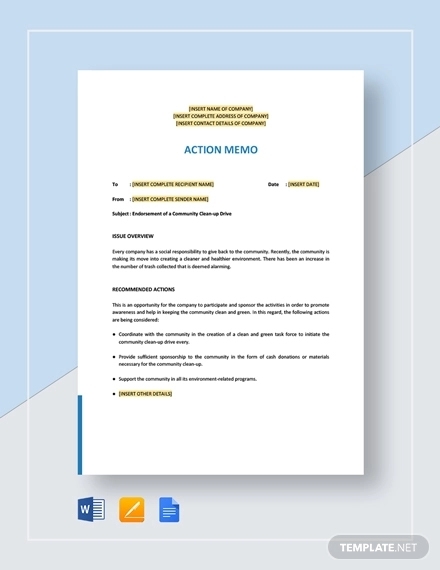 How to Write an Action Memo? An action memo can fall to other categories of memorandums. For instance, it can be considered as an internal memo or an employee memo, as these memos are sent to each member of an organization to instruct them on what to do in a given scenario. Knowing this, an action memo should then consist of the basic parts of a memorandum. This includes the heading and the body. Take note, the heading should specify the purpose of the memo, the date of when it was written, the name of the sender, as well as the recipients. The body would then indicate the message that the sender would like to relay. The sender should focus on the central message of the memo and avoid covering other matters that do not relate to its main purpose. A brief statement regarding the purpose of the memo may also be included, prior to the call to action. We define notes and memos as documents used to relay a message, often utilized within a company’s internal environment. The two is often used interchangeably, as they do have similar purposes. But to be more specific, memos are considered to be short notes. From the word itself, memorandum, we refer to memos as documents used to record something that we must be reminded of. 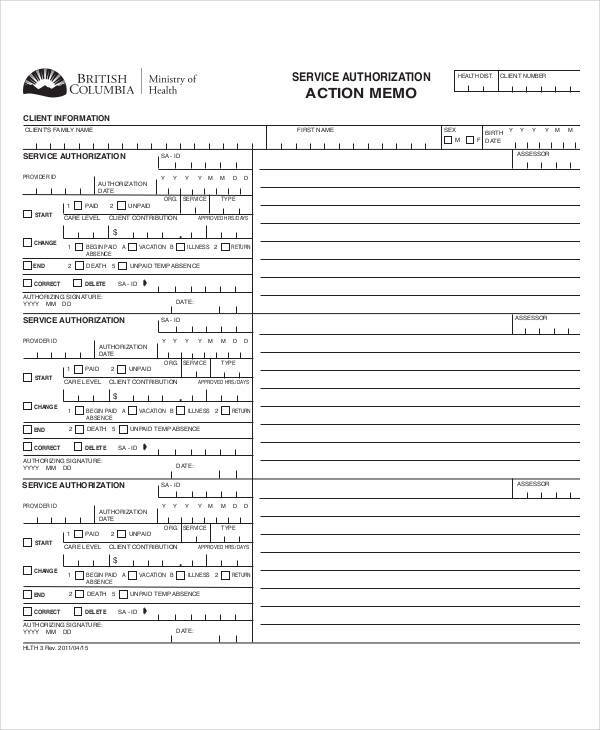 An action memo is just that, it simply informs recipients of things that must be done at a given time. 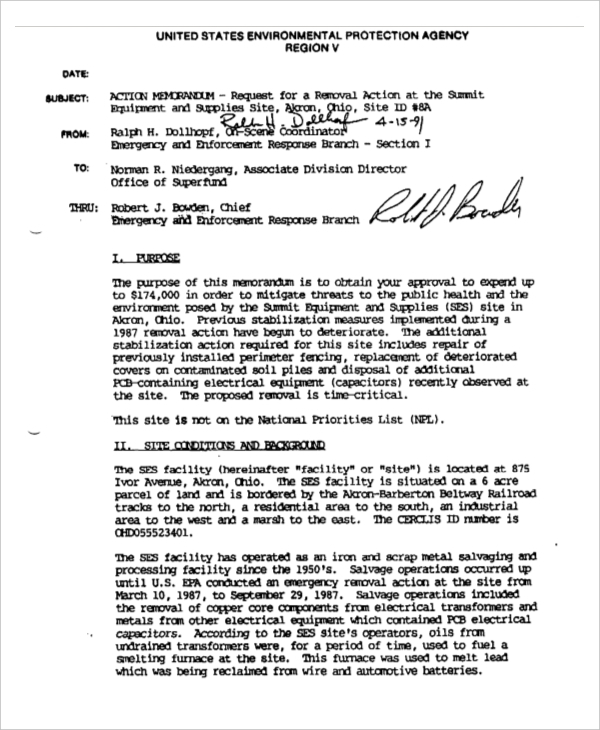 These memos remind its readers of particular actions that they should perform, possibly written after a proposal has been approved. When we think of a memo, it is known to be short, typically single-paged. Although there are some memos that appear more lengthy than others, the content of the body still stays relevant to its main purpose. In order to make a clear, yet concise, memo, it would be best to use bullet points to separate items. This way, it wouldn’t be necessary to use smooth transitions, since bullet points already indicate different ideas. However, it’s still necessary to organize your memo accordingly. This could be in a logical or chronological order, depending on the information given in each item.